May 2017 issue on sale now! | What Hi-Fi? May 2017 issue on sale now! A set-top box battle, budget Blu-ray players, guidance on getting the best pair of headphones as well as all the insights from the Mobile World Conference, the May issue of What Hi-Fi? is not one to miss. 4K - it seems we can't cover enough of it. Everywhere we turn there's a new product that's welcoming the 3840 × 2160 pixel resolution with open arms. 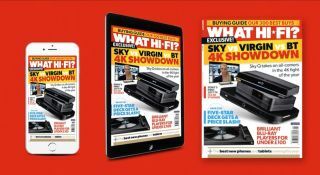 Gracing our cover this month is the 4K combat as Virgin and BT take on Sky; the two companies' set-top boxes looking to match or dispatch Sky Q from its five-star spot. In this head-to-head, there's one clear winner. That said, each set-top-box has a good go-to weapon in their respective arsenals: BT TV has 4K sports coverage delivered via Infinity fibre-optic broadband for less than Sky's equivalent, while Virgin offers flexible multi-room connectivity for its 4K content. There's not one, but two Group Tests this issue - and we begin with a battle of budget Blu-ray players. LG, Panasonic, and Sony all put forward products with smart functionality but each has something a little special, whether it's screen mirroring, 4K upscaling or streaming audio. With the 'vision' part of the equation ticked off, we move to 'sound' and spin some vinyl on turntables from Audio Technica, Dual and Sony. What better way to celebrate the upcoming Record Store Day 2017? How do you choose which headphones are best? Well, yes, apart from looking at our Best Buy guides? If you want to do it for yourself, and know how to call the shots when someone asks for your advice, then our special guide to finding the best pair of headphones is made for you. Since headphones are probably the hi-fi product you use the most, it's definitely knowledge worth knowing. Getting top quality sound and video from a mobile phone has become an increasingly viable option, and Barcelona's Mobile World Conference was certainly proof of that. Sony showcased the world's 4K phone, LG's G6 made its debut with an 18:9 fullvision display, and Samsung's Galaxy Tab S3 tablet looks to challenge Apple's dominance of the market. If you want to know what the next innovations in smartphone tech are going to be, these pages are for you. The high-price product to get your hi-fi heart pumping this month is a digital-to-analogue converter from Benchmark. Priced at £2350, it might not feel that luxurious but it has the sonic chops to back up its hefty tag. We've also got a pair of £3400 stereo speakers from Audiovector. Design-wise, there's no lack in attention to detail - even the hidden fixtures on the underside of the base are nicely made. But does its sound quality match up? But what would an issue of What Hi-Fi? be without a heaping helping of First Tests? We've got a tiny projector from LG, Sony's first television for 2017, a hi-res music player from Acoustic Research and a Dolby Atmos graphics-tablet-come-laptop from Lenovo. Our pages are packed, and it's on shelves now - happy reading!